BANFF, ALBERTA, Canada – Rafting in the Canadian Rockies is the adventure of a lifetime. We know the importance of providing a positive experience that is both challenging and safe. 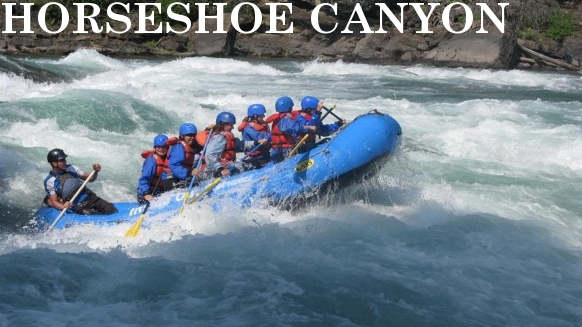 Experience the best rafting in Alberta and the Kananaskis with our experienced guides. If you’re looking for awesome Banff rafting and Jasper rafting, sign up for one of our outstanding tours today! A Bow river rafting tour through the Horseshoe canyon holds some of the best whitewater and largest rapids in Alberta, Canada! A rafting tour through the Horseshoe canyon is ideal for those who have rafted before, or beginners with a real sense of adventure. Cliff Jumping during a Horseshoe canyon tour is for many the highlight of the trip. With two jumps to choose from feel free to stay within your comfort zone (10ft) or step up and push yourself (30 ft). The Canyons spectacular geology makes the area a favorite place for Hollywood to shoot movies. Our experienced guides provide not just excitement, but interpretive information about the features and history of this amazing and unique area. The minimum age weight for this tour is 12 years and 90 lbs. Participants should have some swimming ability and be comfortable in the water. Tour activities may vary depending on water level. Call now and make your reservation on one of our thrilling Alberta rafting tours. Experience exceptional beauty and visceral excitement as you cascade down the roaring rivers of the Canadian Rockies. We bring you the best rafting in Banff and the Kananaskis, as well as sensational Jasper whitewater rafting! Watch this out this cool video from Inside out Experience!